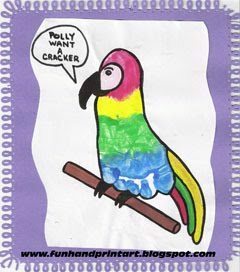 To make this colorful Footprint Parrot, paint stripes in different colors going across the foot. I like to have all my paints with a different paintbrush for each color set out ahead of time. Next, paint on colorful feathers and white where the eye will eventually go. I also painted on a tree branch/piece of wood for the parrot to stand on. When it is completely dry, use black to outline everything, draw on the eye, and to draw on the beak.